That is what Father Agbonkhianmeghe Orobator, the former Jesuit provincial for East Africa, told me on the eve of Pope Francis' six day visit (Nov. 25-30) to Kenya, Uganda and the Central African Republic. A Nigerian, he is now Principal of Hekima University College, Nairobi, which has a School of Theology and an Institute for Peace Studies and International Relations that draws students from many parts of Africa. This is Pope Francis’ first visit to Africa. How significant is it? It is very significant. Africa is the place where Christianity continues to grow. In 2009, Benedict XVI called Africa “an immense spiritual ‘lung’ for a humanity which seems to be in crisis of faith and hope.” However, the recent events on the continent do not seem to bear that out. There is progress in Africa, but still too many socio-economic and political challenges. The threat of sectarian violence and terrorist attacks in parts of the continent is particularly disturbing. You know East Africa well. What’s the situation of the church there? It is a vibrant church. I think the most unique aspect of this church is the phenomenal growth of small Christian communities—neighborhood churches that create a space for Christians to meet, reflect on the Scripture and discern the needs of their context and respond appropriately. 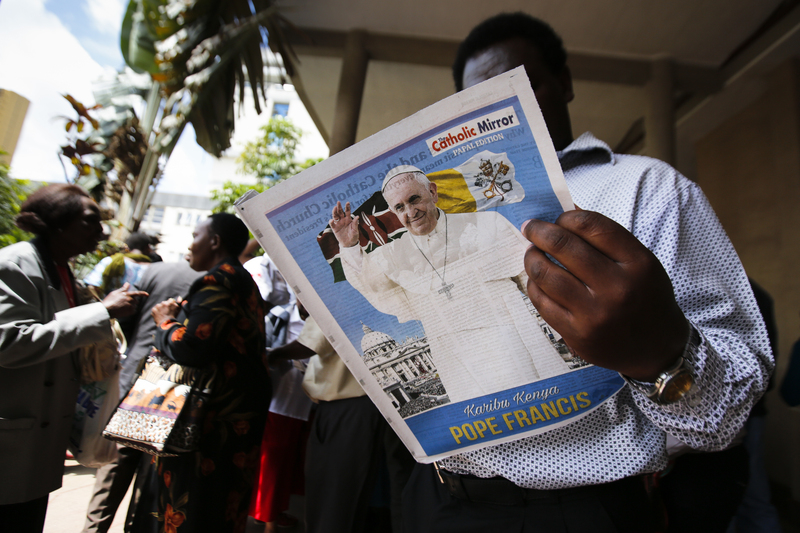 What do people in East Africa think of Pope Francis? Francis is a beloved figure here, judging by the huge media attention his visit is generating. Francis will visit Kenya first. How would you describe the situation there? Is peace at risk? Kenya is relatively stable. We have made much progress since the post-election violence of 2008. But there are still many challenges. Al Shabaab remains the biggest threat to security. The second biggest threat to national security are politicians who have embarked on a despicable corruption spree, which is hurting the country’s economy and image. What is the church in Kenya like? It is a vibrant church, like in most of Eastern Africa. As mentioned, small Christian communities are big here and they play a critical role in representing the church in the neighborhoods. What are the main challenges facing the Kenyan church? Leadership is a crucial issue. How would you describe the relationship between church and State in Kenya? It is a cordial relationship, helped by the fact that the president is a practicing Catholic who is favorably disposed to Catholicism and to other denominations and faiths. What is the relationship like between Christians and Muslims in Kenya? On the face of it, it is a cordial relationship. Christians and Muslims join cause to pronounce on issues of sexual ethics—abortion, gay rights and marriage. In reality, there is underlying tension and several areas of discontent. The terrorist attacks by Al Shabaab tend to aggravate this tension. How significant is it that the pope is visiting the poor neighborhood of Kangemi in Nairobi? Nairobi is a city of enormous contrasts and inequalities. A huge gulf lies between the rich and the poor. We simply take it for granted, but there is past injustice in the segregation of the rich and the poor; the latter live in unspeakable squalor in slums around Nairobi. By visiting Kangemi, Francis reminds us of the task before us: to practice solidarity, compassion and justice in the face of such poverty and deprivation. What do you consider the most significant event of his visit in Kenya? The visit to Kangemi. It is not usual for a visiting head of state to seek out and visit the poor—there is a lesson here for church leaders and political leaders alike. What would you like him to say or do when he’s in Kenya? Acknowledge the pioneering role of Kenya in the campaign for ecological integrity—thanks to the heroic work of Wangari Maathai; challenge the church leaders to be more prophetic and smell more of their sheep; remind all of the need to work towards the emergence of a more just society; call and condemn the cancer of corruption that is destroying Kenya. The pope travels from Kenya to Uganda. What’s the situation like in Uganda? Is the peace consolidated here? There is peace in Uganda, especially now that the LRA [Lord’s Resistance Army] seems to have been defeated. But it is a fragile situation. There are still several ethnic and political fault lines in the country. What’s the church’s situation in Uganda? The church has a long tradition in Uganda. Uganda gave us the Ugandan martyrs. That is a legacy for the universal church. What challenges does the church face in Uganda? There are social issues that face the country and the church—poverty, inequality, corruption, poor infrastructure, etc. How significant is the pope’s visit to the shrines of the martyrs? It reminds us of the gift of Africa to the church. Perhaps not many people in the church know about the Ugandan martyrs. But this is one of Africa’s jewels. What do the Ugandans and the church there hope for from the pope’s visit? I believe that Uganda’s biggest headache now is how to facilitate the transition from the incumbent, Museveni, to a new political leadership. Museveni has been president since 1986, but there is little progress in terms of standard and quality of life. I would advise Francis to remind Museveni that his time is up. From Kampala the pope will fly to Bangui, capital of the Central African Republic (CAR). Francis is planning to spend a night here. How significant in his visit? Like Somalia and Libya, CAR is one of Africa’s failed states. Besides, the conflict in CAR has largely been forgotten. The papal visit will draw attention to the tragedy that is CAR and the suffering of innocent children, women and men. There is much tension, even some fighting in CAR ahead of the pope’s visit. What’s the main reason for this conflict? On the face of it, there is violent sectarian conflict between two factions: anti-Balaka and Seleka. The main reason is failure of leadership. Since the time of self-styled emperor Jean-Bédel Bokassa to the rule of Jean Pierre Bozize, CAR has been the victim of predatory, corrupt and inept putschists and politicians. Do you think his visit can contribute to peace? Yes, definitely. Pope Francis should reach out to the warring factions and encourage them to lay down their arms for the sake of innocent children, women and men who have borne the brunt of this pointless conflict. Are you concerned about his security in the CAR? I wouldn’t think so; but even if it existed, that should not deter the pope. How important is his visit to the central mosque in Bangui? Hugely significant! A powerful gesture and symbol that will help diffuse tension between Christians and Muslims. Pope Francis has decided to open the Holy Door for the Jubilee of Mercy in Bangui. How significant is this? Anything to focus attention on the fate of innocent victims of war and violence in CAR would be important. This is what the Jubilee is about – mercy, compassion, solidarity and justice for the oppressed.